Something amazing happens when teachers openly discuss how to meet the needs of all students. The discussion begins to take the form of a lively debate on what has been tried, what worked, and what needed tweaking. By the end of the discussion, everyone walks away with strategies, ideas, or just simply a different way of looking at their teaching practice. Among the things participants discuss is that the tried and true approach we have used working with disengaged students and the cookie-cutter teaching style that has worked for years without complaint now seem to warrant deep reflection and perhaps an overhaul. But that is what effective teaching is about. To meet students at their level may mean tossing out the old and ushering in the new. Students living in poverty need to know that although we may not have the power or means to change their situation, we can change the way we address their needs, and in doing so provide more opportunities for success. This has been the experience of teachers and community partners who have attended Beyond theBreakfast Program, an ETFO-sponsored professional development workshop on poverty. 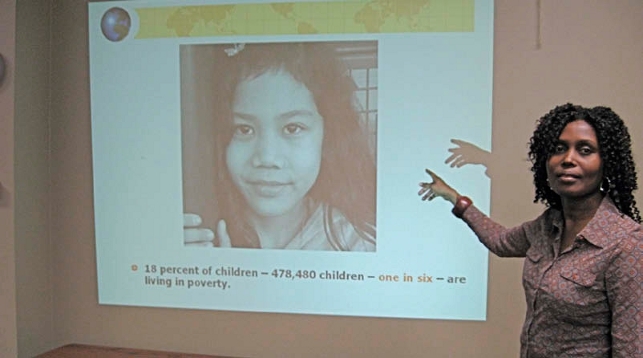 The two-hour workshop presents startling statistics on poverty, myths about what poverty looks like, and the impact of poverty on students. It challenges participants to come to terms with their own biases and attitudes about poverty and student achievement. At the end of the workshop, each participant leaves with informative handouts and a DVD of the presentation, which includes lesson plans and a resource book list. As well, each school in the local receives a poster listing community agencies in the school district. Educators cannot wait for the government to fulfill its promises to reduce child poverty before we adopt measures in our schools and classrooms to address the effects of poverty on our students. In each of the communities where the workshop has been held, schools are putting strategies in place that directly serve the needs of their students. In the Upper Grand District School Board, some schools in Guelph have formed an important partner- ship with West Willow Woods Neighbourhood Group, to provide an after-school program, a snack program, a sports and recreation program and, most importantly, a safe, nurturing environment where students are eager to return each day. Another success story is a school that adopted an “S.O.S” (Save Our Students) philosophy: each teacher voluntarily agreed to mentor 10 to 12 students in their school for the year. Students were able to access their mentors for support, advice, and encouragement. These programs suited these particular schools. They may not be the right fit for all schools, but the point is that they are finding solutions to combat the challenges facing low-income students at their schools. The “no child left behind” mantra does not include only literacy and numeracy. Schools across the province are answering the call to action and are working hard to close the achievement gap by acknowledging that they have students who face poverty, providing suitable programs, building supports in the community and with parents, and critically examining what needs to change in order to meet the needs of all students. developing working relationships with local service agencies that address issues affecting low-income families. For further information about Beyond the Breakfast Program workshops, contact Jim Giles at provincial office: jgiles@etfo.org. In 1989, the House of Commons resolved to end child poverty by the year 2000 . But 18 years later the child poverty rate (11 .7%) is exactly the same . Despite a growing economy, soaring dollar, and low unemployment, one in six children, or 1 .13 million kids, are living in poverty, before income taxes . A job is not enough – 41% of low-income children live in families where at least one parent works full-time all year. The risk of living in poverty is not the same for all children. Poverty affects children in racialized, First Nations, and recent immigrant communities much more often . The average two-parent, low-income family lives on an income that is $11,000 below the poverty line . The average low-income, single-parent family lives on an income that is $9,200 below the poverty line . 2. Poverty is a global challenge. According to the organization Make Poverty History (makepovertyhistory.org), every three seconds a child dies from extreme poverty somewhere in the world. This issue of the magazine reminds us of the work we do in our classrooms and communities every day for equity, and of the tremendous amount of work that has yet to be done.